Home/Charlotte Dentist, Cosmetic Dentistry Charlotte, South Charlotte Dentistry, Teeth Stain Treaments, Teeth Whitening, tooth staining foods, Whitening treatments, Zoom whitening/What Causes Tooth Staining? We all know that coffee, sodas, and red wine as well as other dark colored foods and liquids are common causes of badly stained teeth. But did you know that the stain in teeth isn’t only caused by diet? There are several little-known causes of tooth discoloration that are actually unrelated to the colors of the food we eat. As children our teeth are naturally very white and healthy before we lose our baby teeth and grow in our adult set. The second set of teeth that we get after losing our baby teeth often grows in darker in color than the baby set we had before it. Then, as time moves on these teeth often become even darker regardless of the foods eaten, simply because of our age. As we age our teeth change in their mineral structure. Extremely small cracks and pores open up in the enamel of the teeth and these are quickly filled with minerals from our food and other things that come in contact with our teeth. This is also how dark colored foods and liquids cause discoloration in our teeth, but the teeth may take in minerals from other non-staining foods as well. Teeth can also become stained by bacteria. Our mouths naturally contain bacteria that help us break down our food. These bacteria break down the food and leave behind what we call plaque. Plaque can discolor our teeth both temporarily as it rests on the enamel as well as permanently when the plaque is not removed quickly enough. One very little-known cause of tooth staining is antibiotic medications. Some antibiotics can cause stains in teeth and even permanent tooth discoloration. Antibiotics can also cause decreased brilliance in the tooth enamel. Dr. James A. Wells and the South Charlotte Dentistry team know exactly what causes tooth discoloration and how to help. You shouldn’t let your discolored teeth go untreated. The longer you wait to whiten your teeth, the more likely it becomes that the stain will be permanent. 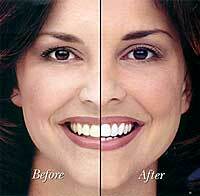 Talk to Dr. Wells to see what type of teeth whitening treatment is right for you. To make an appointment, please don’t hesitate to call 704-759-0908.